Greece’s parliament has rejected the presidential candidate nominated by PM Antonis Samaras, triggering a snap general election. 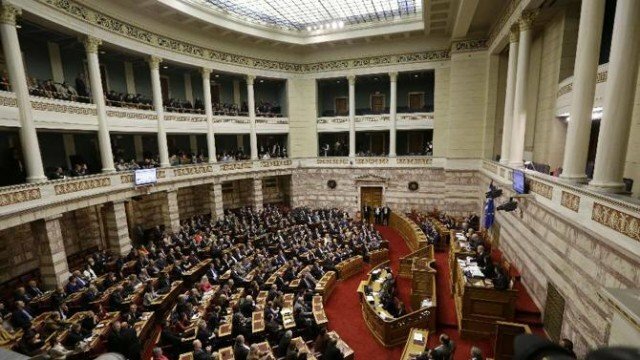 Stavros Dimas failed to reach the necessary 180 votes, which means that parliament will have to be dissolved. Greece’s economy has begun to recover after six years of recession. Greeks have endured years of austerity and the left-wing Syriza party leading the polls wants the terms of a huge EU-IMF bailout renegotiated. Although unemployment in Greece has begun falling from a record 28% early this year, it is still extremely high, at 25.5%. Responding to the vote, the IMF said talks on completing a review of the bailout, which Greece would need if it were to leave the EU-IMF program, would take place only when a new government was in place. The Athens stock market fell 7% as news of the vote sank in, with bank shares among the worst affected. Bank of Piraeus shares slumped 9%, after recovering from earlier record lows. Investors sold off Greek government bonds, pushing bond yields above 9%. The government’s borrowing costs on 10-year bonds rose to 9.7%, in a reminder of the 2010 crisis when 10-year bonds soared above 11%. Bond yields also rose in Spain and Italy, two other countries hit hard by the eurozone debt crisis. Shortly after the vote, Antonis Samaras announced that elections would take place on January 25. “The country has no time to waste,” he said in a televised address. Stavros Dimas, a former European commissioner, secured the votes of only 168 lawmakers, the same number he had won during the second vote last week. The government failed to attract the support of two smaller parties, Independent Greeks and Democratic Left, which it needed to win the vote. The defeat is regarded as a major setback for the prime minister, as well as for eurozone countries that worked hard to bring Greece back from the brink in 2010. Since then €240 billion ($290 billion) has been spent helping Greece pay off its debts. In return for two major bailouts, the EU and IMF demanded stringent austerity measures.